The scalable West Virginia map on this page shows the state's major roads and highways as well as its counties and cities, including Charleston, the state capital and most populous city. To display the map in full-screen mode, click or touch the full screen button. To zoom in on the West Virginia state road map, click or touch the plus (+) button; to zoom out, click or touch the minus (-) button. To scroll or pan the zoomed-in map, either (1) use the scroll bars or (2) simply swipe or drag the map in any direction. (The scrolling or panning method you use will depend on your device and browser capabilities.) At any time, you can display the entire West Virginia road map in a new window or print this page, including the visible portion of the map. West Virginia's Interstate Highways connect its major cities and facilitate travel between West Virginia and its neighboring states. I-64 traverses southern West Virginia from east to west; I-77 crosses the western part of the state from north to south. I-79 connects Charleston with northeastern West Virginia, from whence it crosses the Pennsylvania border. I-68, I-70, and I-81 also pass through small portions of the state. I-470 bypasses Wheeling to the south, commencing at I-70 in the east and crossing the Ohio River into Ohio in the west. The Mountain State's northern panhandle contains about 16 miles of the historic National Road, including the venerable Wheeling Suspension Bridge, which opened to the public in 1849. In lower West Virginia, Route 60 offers a winding road trip complete with rugged mountain views from Charleston to White Sulphur Springs. This 120-mile drive ascends through the Allegheny Mountains and enters Hawks Nest State Park which offers a gondola ride carrying passengers down into New River Gorge. It continues over the peak of Big Sewell Mountain, which served as a camp for Robert E. Lee and his troops in 1861, and ends at the famous mineral baths in White Sulphur Springs. 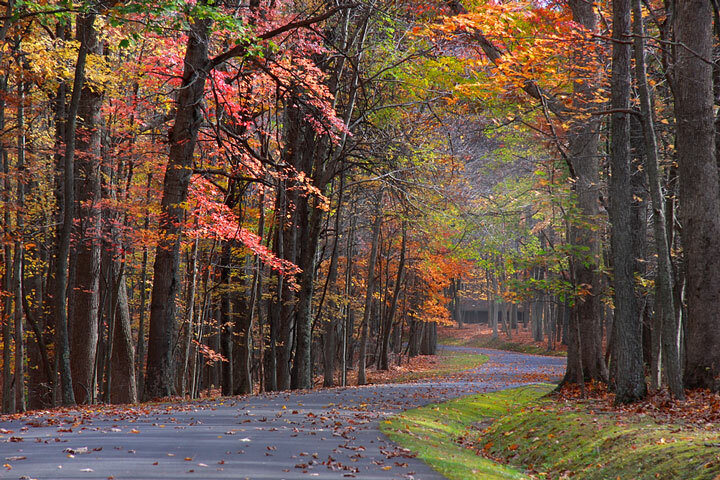 More information about scenic roads in West Virginia is available on this West Virginia Byways website. For more information about West Virginia's roads and transportation infrastructure, visit the West Virginia Department of Transportation website. For West Virginia road traffic conditions, visit the Federal Highway Administration's West Virginia Traffic Information page.